A mining firm has defended its plans to dig out 800,000 tonnes of coal from an opencast site on the western edge of Newcastle. Banks Group lodged a planning application for the development, at Dewley Hill near Throckley, with the city council last week. It says there is an economic benefit to mining coal in Britain. More than 15,000 people have signed an online petition over fears about the potential environmental impact. The scheme would also see 400,000 tonnes of clay removed from the site. Rachel Locke, of Save Newcastle Wildlife, said: "All the mature trees and hedgeland will be lost, there's grassland and wetland there as well. "There's a multitude of habitats for wildlife and a plethora of wildlife that will be lost. "We don't see why we should have to go through this devastation." Image caption One villager told the BBC she wanted her children "to run about in the fields, to breathe clean air and hear birds sing"
Banks Group operates several opencast sites in the North East of England including at Shotton, in County Durham. A series of protests have been staged at its Dipton mine, also in County Durham, amid concerns about environmental damage. Meanwhile, its application to mine near Druridge Bay on the Northumberland coast is awaiting government approval after a series of challenges. 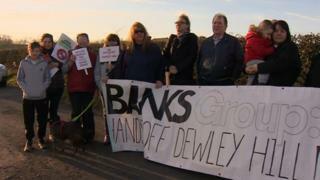 Banks Group said 50 jobs would be created by the Dewley Hill venture. Jeannie Kielty, from the firm, said: "On our existing sites we have environmental management plans and we make sure we run them to the highest standards. "Given coal is still needed in the UK, it makes greater environmental, economic and social sense to mine our own coal rather than import it. "Our restoration plans, which are included in the application, are a series of really positive things for the area." You can see more on this story on Sunday Politics in the North East and Cumbria on 31 March at 11:00 BST and on the iPlayer for 30 days.